I’ve been intrigued by acupuncture ever since my friend told me about her experience. Her acupuncturist looked at her tongue and knew she drank coffee, cured her back pain and got her period back on track. So I dug a little deeper to find out what all this was really about. 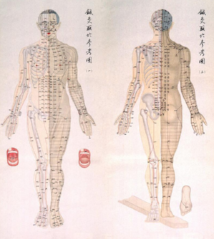 According to Traditional Chinese medicine, acupuncture is the practice of inserting specific combinations of needles into the body at various depths to bring balance of ying and yang to your qi (pronounced chi). It’s been used for pain, hormonal imbalance, headache, allergies, and to promote overall wellbeing. I kept hearing about the same acupuncturist essentially performing miracles and all this talk of balance had me interested, so naturally, I wanted to experience it first hand. I didn’t have a serious injury, body pain, inflammation, or hormonal struggles that would typically warrant a visit, and it definitely wasn’t cheap, but I always love a different, holistic and personalized perspective when it comes to health. I thought of it as an investment and part of my education. I was surprised and excited to find out the acupuncturist was also an M.D. of Chinese Medicine. Something about the sound of that made it seem like it would open the door to a new wave of health for me. Which it did! I went to her office and proceeded to fill out a very long intake form, which guided the rest of our session. I told her I wanted to focus on gut health since I experienced uncomfortable bloating as well as some chin acne I couldn’t get rid of. She asked me questions about everything from my menstrual cycle, from the temperature of the food I eat and my relationship status to my upbringing and sleep patterns. It was completely comprehensive. Because I graduated from the Institute of Integrative Nutrition, I knew the reason behind some of the seemingly obscure questions. I knew why she asked if I put ice in my morning smoothie - she wanted to know if I’m starting my day with something cold which can impact your digestion. I knew why she asked if I was birthed vaginally or by C-Section - this can effect your microbiome. What did surprise me, but should have been so clear, was what I mentioned about my sweet tooth. I told her I craved figs. CRAVED! So much so that I couldn’t resist buying them and would eat a whole bag.. I always accredited it to wanting something sweet but the specificity of figs made her question if they had nutrients I wasn’t getting enough of. The first one she suggested was magnesium and a light bulb went off. The past month or so I had been taking magnesium every night before bed and also noticed a very clear decrease in my fig craving. In fact, I hadn’t even wanted any figs since I started the magnesium supplement! Our bodies are giving us signs all day long of what we need. We just have to tune in and listen to the clues! After all of the questions, she listened to my pulse, checked my tongue and asked me a few more questions before beginning with the needles. There were a few places in my body; neck, abdomen, feet that she pressed on and were tender. She then applied pressure to a corresponding part of my body, and checked the tenderness again, which decreased in each area. She put the needle into the corresponding areas and then in a few more places as well; my right cheek, my inner arm, below my pinky, above my eyebrows, etc. FAS-CIN-ATING! I kept asking her questions but I knew we couldn’t even scratch the surface of what was going on. I picked up on how intricate of a process acupuncture is as soon as it began. Our bodies are essentially maps, and she wanted to focus on both liver and hormones, so she outlined those places in my body to apply needles. I’m still not entirely sure how this works, or exactly what was going on to be honest. I could only ask so many questions before she began rubbing some essentially oils on my feet, abdomen and neck, and then dimmed the lights for me to find stillness. I was loving it. I definitely felt the needles in my skin, which was bizarre, but I was enjoying and trusting the process. When she eventually came back in, we spoke about next steps. We decided that I should try incorporating meat into my diet, which was something I had been considering for a while, but was really just waiting for the validation to start. I rarely felt satiated, and my body had been giving me signs to eat meat for a few months. I agreed with her that this was something I should start doing. She recommend bone broth, and adding in specific medicinal mushrooms and herbs for gut health. She also recommended I eat more warm foods. My diet prior was mostly the same day to day; smoothie, salad, cold previously roasted veggies + protein. Nothing was warm except my morning coffee. This can cause discomfort with digestion, especially in the warmer months and according to Chinese Medicine, eating warm foods is healing and balancing. She also mentioned I could try to reduce bean and grain intake, as these can be upsetting to digestion as well. I already don’t consume many beans and grains, so I took this with a grain of salt (ha get it). I left with a zillion more questions I wanted answers to, but also with a comprehensive list of recommendations and suggestions to heal my body as a constitution from the inside out. I was interested in her herbal recommendations, because that’s not something I had been exposed to. She recommended a bunch of different herbs and mushrooms to help with my gut and digestion so I took a little trip to Flower Power in the East Village which is now my new favorite place. So. many. herbs. I went crazy and it only cost me $24! If you want a full break down of the herbs I purchased, why I want to incorporate them, and how I consume them, let me know! I’d be happy to go into detail on this! Want to stay in the know when it comes to all things health & wellness. Sign up for non-spammy, informative and fun emails!